So I drove out to COTA last week for a day (2/23) at COTA with MVP Track Time on my 02 Boxster S. 1,000 miles! But it was worth it. This was my very first experience at COTA. What a great track and facility, but it had been raining all night and early morning with lots of fog, so it was not looking good. Fortunately, the rain subsided and the track was partially dry by late afternoon during my 3rd session, then almost dry on my 4th and last session of the day. Looking at the video, I was definitely holding back because of the wet track, especially after the guy in front of me in a Miata spun around on the track on the very first turn right in front of me on the first session... and not to mention the $1,200 per linear foot it costs you if you damage the railing... but I still have a ton to improve on for next time! Had a chance to talk to a super nice Tom Stephens with his TuneRS SPB Boxster getting ready for next weekend's PCA race @ COTA. Last edited by AZ986S; 02-27-2018 at 06:43 AM. Nice, looked like the accusump barely fired and then only in conjunction with low rpm events? Last edited by AZ986S; 02-27-2018 at 07:05 PM. Your lines are excellent and you did a good job of hitting the apexes. Hope your next track day is drier. The giveaway is that there is no visible shadow right under the plane. 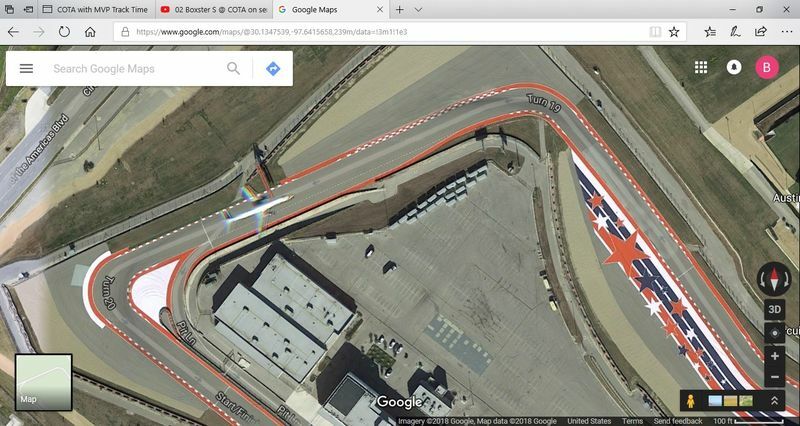 It is in flight at altitude and by coincidence lined up with the track. The shadow is a mile away up to the left. Cute coincidence!